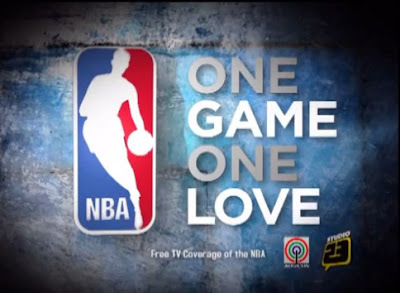 ABS-CBN, the official home of the NBA on Philippine free-to-air television, brings the non-stop NBA action live beginning Wednesday (Oct 30), 8 AM, on Studio 23 as the National Basketball Association 68th season formally kicks off its 2013-2014 season with reigning back-to-back champions Miami Heat battling the returning Derrick Rose and his Chicago Bulls. Ever since ABS-CBN bagged the exclusive rights to air the NBA on Philippine free TV, more Filipino basketball fans have been able to enjoy the NBA games and watch the best players in the world compete. Data from global research group Kantar Media showed that from a total of 34.7 million viewers in 2012, viewership of the NBA games on free-to-air television channels ABS-CBN and Studio 23 increased to 65 million in 2013, which proves the growing interest in basketball among the Filipino audience. The NBA also hit its all-time high national TV rating of 20.87% in the Philippines during the recent finals. The first NBA Global game in the country, where the Indiana Pacers and the Houston Rockets visited the country for a pre-season game, also made it to the headlines and landed on the front pages of newspapers, thereby affirming the significance of basketball to Philippine culture. This Wednesday (Oct 30), the whole world will surely tune in as the 68th NBA season opening ceremonies feature the presentation of the championship rings and the raising of the Miami Heat’s 2013 championship banner. All eyes are also set on the return of former MVP Derrick Rose after sitting out the 2013 season due to a knee injury. Watch the highly-anticipated opening of the 2013-2014 NBA season live this Wednesday (Oct 30) on Studio 23 with a same day primetime replay at 8:30 PM. Studio 23 also airs the 30-minute magazine show “NBA Action,” that will recap the weekly highlights of the NBA, beginning Saturday (Nov 2) at 11:30 AM.